Wir bitten um kurze Voranmeldung zur Veranstaltung unter E-Mail office@basis-wien.at oder telefonisch unter: 01 5226795. The Fine Art Archive arose in 1984 as a part of the activities of Gallery H in Kostelec nad Černými Lesy. It has turned into a significant institution of the Czech fine art territory in the past years. It has become indispensable for researchers, students, institutions and wide public. The main Archive’s activity is to collect and process documents that are associated with contemporary Czech fine art, namely exhibition catalogues, art monographies, invitations, books, texts, magazines, photographs, transparencies, etc. The Archive has collected hundreds of thousands of documents until today, occupying more than 2,000 metres of shelves. It represents the largest collection of documents with this specialisation in the Czech Republic. Besides the inventory we also run a library that is focused on fine art. The library functions also as a documentation and research centre. We process the documents that are deposited in the archive so that they can be incorporated into our extensive database abART (www.isabart.org) with the online full open access content and monthly incoming traffic of over 25,000 visitors. AbART was created to record as precisely as possible, to classify and process in-depth all documents deposited in the Archive. Currently, there have been filed about 142,000 persons, processed 163,000 documents, 63,000 exhibitions and other events and created around 2,100,000 connections between them. As part of our activities we publish our own books and organize exhibitions, both connected mainly to the topics of our Archive, besides that we collaborate with various institutions and publishers on bigger research and publication projects. The whole Archive, including the research centre, library and the information system abART is a long-term project that we have been running for many years. The Fine Art Archive is supported by the Ministry of Culture, the Prague Municipality and The State Cultural Fund of the Czech Republic. Founded – as an art initiative – by György Gálántai and Julia Klaniczay in 1979, Artpool (after 10 years of illegal and 25 years of non profit existence) since 2015 is a department of the Museum of Fine Arts and contains the archives, publications and other records of exhibitions which it organized independently in Hungary before 1989 and as a public organization after the end of communist rule. Artpool has had a long-standing mission to connect Hungarian culture with the international art scene, as well as to document the activities of those artists in Hungary and elsewhere in Eastern Europe who were placed in marginal positions by official cultural institutions prior to 1989. 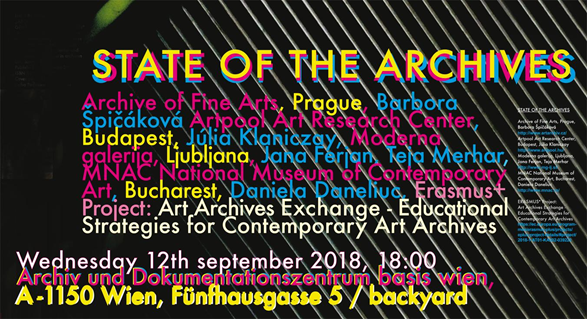 The archive beside being one of the most important records of non-conformist art practices in Eastern Europe (with documents concerning the progressive, non official Hungarian art tendencies from the 70s, and the Hungarian samizdat art of the ’70s, and ’80s including alternative art scenes and groups, contemporary music, underground art magazines, etc.) 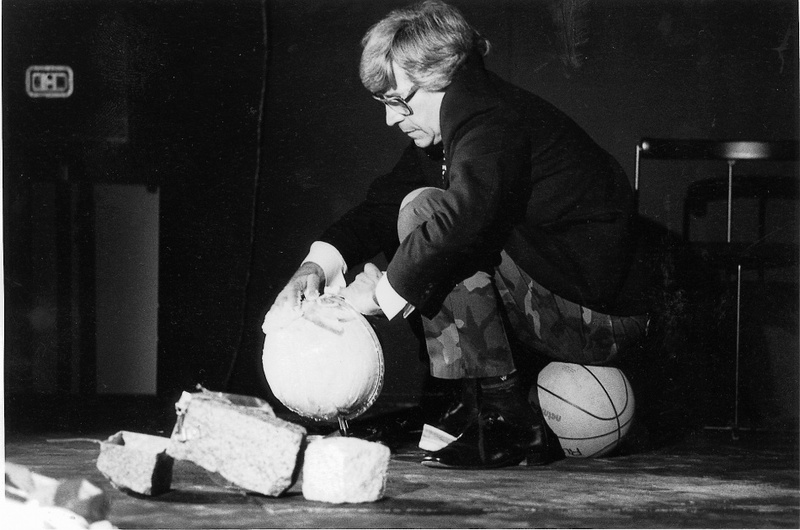 holds a unique documentation and collection of the international art tendencies and movements from the 60s on (Fluxus, Performance, Conceptual Art, Installation, Visual Poetry, Artists‘ bookwork, Mail Art, Copy Art etc.) and supports the work of researchers from around the world. Moderna galerija (MG) was founded in 1948 as Slovenia’s national museum of modern art. Its tasks were to collect and present Slovenian (and other Yugoslavian) art, stage retrospectives, overview and theme shows, and host international exhibitions. Between 1955 and 1986 it organized the Ljubljana International Biennial of Graphic Art, which then went on to become an independent institution. With its program, Moderna galerija helped introduce contemporaneous (first modernist and later other) trends in Slovenia, opposed to ideological dogmatism on all levels, and promoted Slovenian art and artists internationally. In 2011, MG’s activities expanded to its new premises, the Museum of Contemporary Art Metelkova (MSUM). In addition to staging temporary shows, this hosts a permanent display of the international Arteast 2000+ collection, founded in the second half of the 1990s with the aim to articulate contemporaneity and provide a basis for a balanced approach to the so-called Eastern and Western art. The MG+MSUM collections foster dialogue and in-depth reflection on the dialectic relationships between the modern and the contemporary. Moderna galerija’s Archives Department was founded in 1971. It systematically follows exhibitions in Slovenia, collating, systematizing, and classifying biographical and bibliographical data on Slovenian fine artists, photographers, designers, architects, art critics, curators, and theorists. Founded in 2002 and officially opened at the end of October 2004 the National Museum of Contemporary Art (MNAC) has taken over from the former Office for Documentation and Art Exhibitions (ONDEA – an official organization in the framework of the former Ministry of Culture under the Nicolae Ceusescu’s regime) a comprehensive and unique documentary archive of various materials about modern and contemporary artistic life in Romania and abroad. The documentary archives of MNAC are organized according to relevant thematic criteria (important topics in the state of contemporary art production before and after 1989 in Romania) and practical criteria (chronological, alphabetical, location-based etc). On occasion of the start of the Erasmus+ Project „Art Archives Exchange – Educational Strategies for Contemporary Art Archives“, our four project partners will introduce themselves with short presentations. 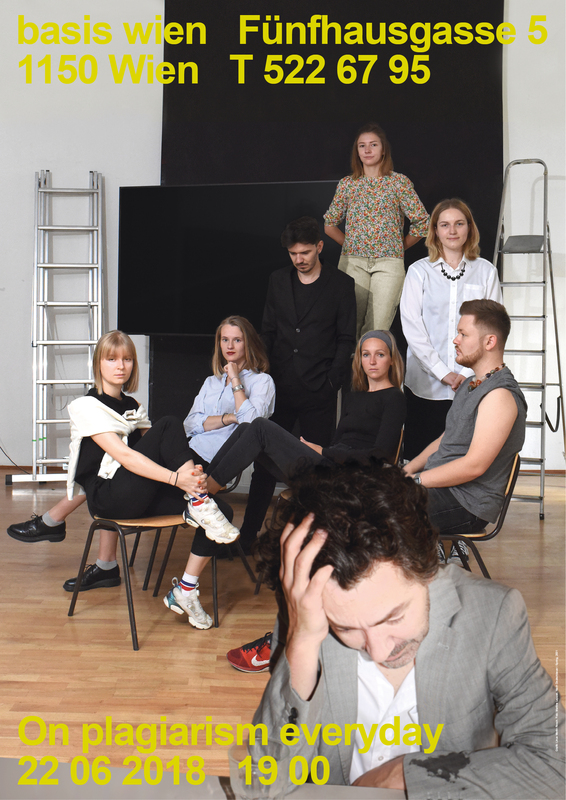 In the following discussion they will talk about their current work and the challenges of archiving contemporary art in various European countries. Anlässlich des Starts des Erasmus+ Projektes „Art Archives Exchange – Educational Strategies for Contemporary Art Archives“ stellen sich unsere vier Projektpartnerinnen / durch kurze Präsentationen vor. Im Anschluss gibt es eine Diskussion zum Stand ihrer aktuellen Arbeit und den aktuellen Herausforderungen der Archivierung zeitgenössischer Kunst in verschiedenen europäischen Ländern. Bazon Brock, geb. 1936 in Stolp/Pommern, Denker im Dienst und Künstler ohne Werk, ist emeritierter Professor am Lehrstuhl für Ästhetik und Kulturvermittlung an der Bergischen Universität Wuppertal. Weitere Professuren an der Hochschule für bildende Künste Hamburg (1965–1976) und der Universität für angewandte Kunst, Wien (1977–1980). 1992 erhielt er die Ehrendoktorwürde der Eidgenössisch Technischen Hochschule, Zürich und 2012 die Ehrendoktorwürde der Hochschule für Gestaltung Karlsruhe. 2014 wurde ihm die Honorarprofessur für Prophetie an der HBKsaar, Saarbrücken, verliehen. 2016 erhielt er den Von der Heydt-Preis der Stadt Wuppertal. In den 1960er Jahren entwickelte er die Methode des »Action Teaching«, bei dem der Seminarraum zur Bühne für Selbst- und Fremdinszenierungen wird. Von 1968 bis 1992 führte er in Kassel die von ihm begründeten documenta-Besucherschulen durch. 2009 leitete er die Besucherschule zur Ausstellung »60 Jahre. 60 Werke« im Martin-Gropius-Bau Berlin. Er moderierte elf Jahre lang die Sendung Bilderstreit – Kunst im Gespräch in 3sat. Rund 3000 Veranstaltungen; zum Beispiel: Wa(h)re Kunst. Der Museumsshop als Wunderkammer (seit 1994 in 18 Städten); Lustmarsch durchs Theoriegelände (2006, in elf Museen); Tag der Weltzivilisierung (24.11.2007 u. 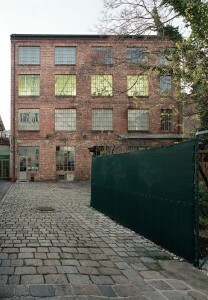 2008); mehrere Gemeinschaftsaktionen mit Joseph Beuys, Nam June Paik, Friedensreich Hundertwasser und Wolf Vostell. Von 2010 bis 2013 leitete er das Studienangebot „Der professionalisierte Bürger“ an der HfG Karlsruhe. Von Mai bis November 2014 fand im ZKM Karlsruhe die Ausstellung “Beuys Brock Vostell. Aktion Demonstration Partizipation” statt, die Bazon Brock mit zahlreichen Führungen begleitete. Er gründete zahlreiche Institute, darunter das Institut für Rumorologie/Gerüchteverbreitung, das Labor für Universalpoesie und Prognostik, das Büro für Evidenzkritik, das Institut für theoretische Kunst, das Pathosinstitut Anderer Zustand und die Prophetenschule. Seit 2011 betreibt er die Denkerei/Amt für Arbeit an unlösbaren Problemen und Maßnahmen der hohen Hand mit Sitz in Berlin (www.denkerei-berlin.de). Presentation of the publications realised within the frame of the interdisciplinary project gathering graphic design and applied photography and time-based media students from the University of Applied Arts Vienna. With works by: Julia Bichler, Terézia Denková, Martina Lajczak, Wietske Nutma, Linus Merlin Resch, Mato Vincetić, Tina Zeltwanger. Our attention has been irreversibly captured by information and communications technology. Scrolling through a device is what we do all day long, often mindlessly, to find whatever it is we are already looking for. We download or stream a song, article, book or movie instantly, get through it—or not—and move to the next immaterial thing. We skim, bookmark, copy, cut, paste, and forward. We post, repost, insta, and regram in all directions at all times. In fact, digital media trains us to be not only high-bandwidth consumers but content producers at no cost. On plagiarism everyday intended to slow down from rapid-fire online publication. Instead, it focused on off-line publishing aesthetics and, in an age of memes, on a set of editorial strategies of reproduction — such as sampling, duplication, plagiarism, recycling, ciphering, to name a few — in order to observe the relationship between a thing and its mediated repetition. By appropriating a publication in print, an existing form eventually got translated into a personal selection, in a print-on-demand assembly of paper and ink, with a spine and double spreads. Anlässlich des Internationalen Tages der Archive am 09.06.2018* öffnet basis wien für 4 Tage ihre Räumlichkeiten und widmet sich, neben einer kleinen Präsentation ausgewählter Archivalien aus dem Archiv und einem Vortrag des Generaldirektors des österreichischen Staatsarchiv Dr. Maderthaner, ausschließlich persönlichen Anfragen. Künstler_innen, Kurator_innen, Journalist_innen, Galerist_innen und Interessierte haben die Möglichkeit Materialien dem Archiv zu übergeben, ihre Einträge zu aktualisieren, persönliche Gespräche zu Archivierungs- und Dokumentationsfragen zu führen oder mit Unterstützung der Archivarinnen in den Beständen des Archivs zu recherchieren. *Der Internationale Archivrat (ICA) hat den 9. Juni zum “Internationalen Tag der Archive” erklärt. Dies ist das Datum seiner Gründung unter der Schirmherrschaft der UNESCO im Jahr 1948. Archivinstitutionen in vielen Staaten der Welt feiern jährlich diesen Tag.